With a stay at Best Western Palestine Inn in Palestine, you'll be within a 5-minute drive of University of Texas at Tyler Palestine Campus and Green Park. Featured amenities include a business center and a 24-hour front desk. Free self parking is available onsite. Located in Palestine, Super 8 by Wyndham Palestine is a 4-minute drive from University of Texas at Tyler Palestine Campus and 6 minutes from Green Park. Free self parking is available onsite. 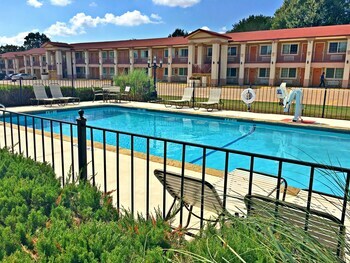 Located in Palestine, Town and Country Motel is within a 5-minute drive of Green Park and University of Texas at Tyler Palestine Campus. Free self parking is available onsite.